What a fascinating story! Wishing you all a blessed Holy Week journey toward Pascha! 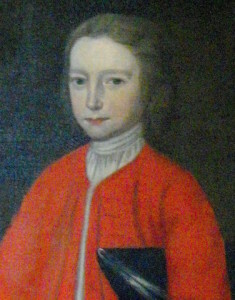 Philip Ludwell III is the first known convert to Eastern Orthodox Christianity in the Americas. He was a prominent figure in pre-revolutionary Virginia and a relative by blood or marriage of many great early figures in American history from George Washington to Lee. The scion of one of the largest landholding and politically prominent families in early Virginia, he was born at Green Spring near Williamsburg on December 28, 1716. In 1740 Ludwell returned to Virginia. From 1742 to 1749 he was a member of the Virginia House of Burgesses where he argued for higher taxes on the importation of African slaves and headed a committee to seek a cure for cancer. In 1752 he became a member of the Royal Governor’s Council and served in this capacity until his death in 1767. As a member of the Council he was instrumental in obtaining a commission for a young George Washington as a Colonel in the Virginia militia in 1755. One extant copy of what may be this ordo has been found in bound, but handwritten, form. It includes translations of the three principal Orthodox liturgies, morning and evening prayers, the service of confession and other texts. Philip Ludwell died in London on March 14, 1767 after a long illness. His funeral rites were served at the Orthodox Church there and he was buried at the Anglican church of St Mary Stratford Bowwhere there was a family vault. Over two hundred years later his life and inspiring story of faith is becoming known and reshaping our view of early America. This entry was posted in Conversion Stories, Orthodoxy All Over the World and tagged a founder of the Ohio Company, from George Washington to Lee, great early figures in American history, Lee Family of Virginia, Philip Ludwell III, pre-revolutionary Virginia, Stratford Hall Plantation, the Declaration of Independence, The First Known American Convert, The First Known American Convert to Eastern Orthodox Christianity.